My card to share today is one made for a family member who hopefully doesn't follow my blog. I wanted to use the Heartfelt Creations matching stamp and die set called Sunkissed Fleur which I've combined with other die cuts. The flowers were stamped onto paper printed from Artylicious (now Chocolate Baroque) Seasons Greetings collection and then cut out using the die. Although these CDs are mainly Chritsmas designs there are quite a lot of generic papers suitable for lots of other uses. I cut a trellis in green and popped it behind a Spellbinders decorative label 22 die cut as a frame, added a Sizzix swirl and the flower centres are tiny circles with micro beads added for a touch of sparkle. Message was stamped and punched with Stampin' Up punches and then put onto one of the smaller Decorative label dies. Obviously the backing paper is the same print as the flowers and the square layer was white card embossed using a diamond mask and coloured with distress ink. A white ribbon to match the frame and that's it - job done although I may make a box for this one too. very pretty card Val - thanks for reminding me I have all the Artylicious cds, which rarely get an airing these days! Those flowers are stunning Val, and it's such a beautiful card. I'm sure the person receiving this will love it too. Lovely card Val, love the matching embossing and die, flowers are so pretty! I agree that seasonal papers are often usable for other occasions & this shows it superbly - I love the splashes of white & how your trellises (perhaps trellii??) in both the die-cut & the diamond embossing echo each other. I'm sure your family member will love this pretty card Val. 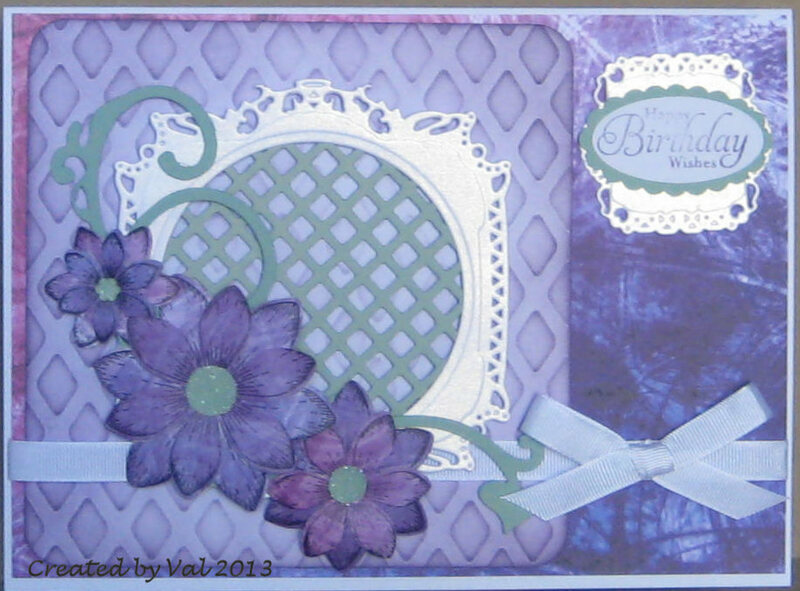 Your center die cut is just lovely with the lattice and pretty lavendar colors. This is lovely Val and I'm so glad to see you eventually got the matching stamp set! Really like the trellis - it so says "garden"; especially with the Sunkissed Fleur.